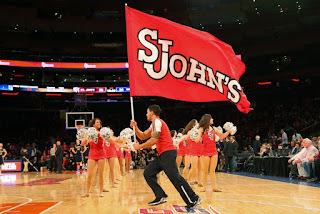 St. John' plays about 4 basketball games every season at Madison Square Garden, so today we decided to go to see them play Big East rival, Seton Hall. The game was very close as neither team led by more than 6 points. At the end of regulation, the score was tied at 70. However, Seton Hall pulled ahead in the overtime period and won the game 81-74. Khadeen Carrington scored 22 including 6 in overtime to lead the visitors to victory.